William B. Eerdman’s, Grand Rapids, Michigan, 2014. 84 pages. What are the essential elements of the Christian life? I am not thinking in terms of individuals leading wonderful lives, but just in terms of those simple and recognizable things that make you realize that you are part of a Christian community. This little book is designed to help you think about four of the most obvious of these things: baptism, Bible, Eucharist and prayer. Christians are received into full membership of the Church by having water poured or sprinkled over them (or, in some traditions, being fully immersed); Christians read the Bible; Christians gather to share bread and wine in memory of the death and resurrection of Jesus of Nazareth; and Christians pray. There is a huge and bewildering variety in Christian thinking and practice about all kinds of things, but these four basic activities have remained constant and indispensable for the majority of those who call themselves Christians. 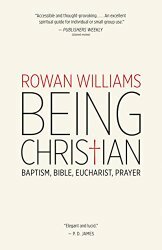 In this book we shall be looking at what those activities tell us about the essence of Christian life, and what kind of people we might hope to become in a community where these things are done. As I said, this is a short book. I read small parts of it each morning for a couple weeks. The author did get me thinking, and got me looking at these essentials of the Christian faith in a new way. One of the things that Christian people characteristically do is read the Bible – or rather, in quite a lot of circumstances, they have the Bible read to them. It is worth remembering, especially for us who are inheritors of the Reformation and part of a literate culture, that for the huge majority of Christians throughout the centuries, as well as for many today, the bible is a book heard more than read. And that is quite a significant fact about it. For when you see a group of baptized people listening to the Bible in public worship, you realize that Bible-reading is an essential part of the Christian life because Christian life is a listening life. Christians are people who expect to be spoken to by God. For Christians, to share in the Eucharist, the Holy Communion, means to live as people who know that they are always guests — that they have been welcomed and that they are wanted. It is, perhaps, the most simple thing that we can say about Holy Communion, yet it is still supremely worth saying. In Holy Communion, Jesus Christ tells us that he wants our company. That, in a nutshell, is prayer – letting Jesus pray in you, and beginning that lengthy and often very tough process by which our selfish thoughts and ideals and hopes are gradually aligned with his eternal action; just as, in his own earthly life, his human fears and hopes and desires and emotions are put into the context of his love for the Father, woven into his eternal relation with the Father – even in that moment of supreme pain and mental agony that he endures the night before his death. There’s more in this book, but this will give you an idea of what to expect. I found surprisingly many new insights about these fundamental practices. This entry was posted on Saturday, August 1st, 2015 at 10:10 pm and is filed under Christian, Nonfiction Review. You can follow any responses to this entry through the RSS 2.0 feed. You can leave a response, or trackback from your own site.